The Grove City Sewer Maintenance Division is responsible for the repair and maintenance of the City’s sanitary sewer mains and storm water collection system. The sanitary sewer collection system is made up of over 159 miles of sewers, ranging from 8″ to 48″ in diameter. The system contains over 4,600 catch basins and curb and gutter inlets and 3,300 sanitary manholes. Maintenance duties include video inspection of sanitary sewer mains and appurtenances; washing, cleaning and repair of sanitary sewer mains and manholes; removal of debris and structural repairs to catch basins. The City of Grove City actively maintains its wastewater and stormwater sewer systems. These programs are designed to maintain optimum capacity and ensure the structural integrity as the infrastructure ages. This preventive maintenance program helps ensure sewer’s mains remain in proper working order. Stormwater Wastewater Sewer & Sanitary Sewer Maintenance information. For fire hydrant questions or repair, please call the Jackson Township Fire Department at 614-875-5588. The City utilizes its in-house resources to complete an annual catch basin cleaning program and repair between 30-40 storm inlets each year. The cleaning of the catch basins (storm inlets) helps ensure that debris (leaves, trash, grit, etc) does not accumulate within the system and cause surface flooding. For additional information, download the Municipal Separate Storm Sewer System (MS4) Map. The City of Columbus is responsible for the water distribution system in Grove City, as well as, any repairs to the water lines. If you have problems with water leaks, low water pressure or discolored or foul tasting water, call the Columbus Division of Water at 614-645-8270. The Grove City Service Department is responsible for maintaining the sanitary sewer mains. The property owner is responsible for maintaining their sanitary sewer laterals, which run from the house or business to the sewer main. If you think you smell sewer gas or drains are backing up into your home please call 614-277-1100. The Grove City Service Department will check the main and assess the situation. If you have an emergency after 4 p.m. contact the Grove City Division of Police at 614-277-1710. The City of Grove City is currently conducting a comprehensive sewer maintenance program of the public sanitary sewer collection system. This evaluation is a proactive effort to manage the cost of the sewer system through early detection of defects and strategic planning of improvements. The effort involves the evaluation of the flows and structural condition of the pipes within the collection system which includes over 162.5 miles of sanitary sewer. The program’s goal consists of routine cleaning the public sewer main in which an obstruction may result in a backup into a residence or business. The routine cleaning frequency for these sewers vary depending on the age, location, maintenance history, and type of pipe material. Typically the sewers in the older areas (see map depicting age of sewers in older area of the City) are cleaned every 20 years (5% of the system cleaned each year) while they will be visually inspected every 5 years. Download the City’s Capacity, Management, Operation, and Maintenance (CMOM) Program, which guides the City’s sewer system management procedures. Please reference the Sewer Cleaning and Inspection Map which shows the areas of the City which have been included in the program the past few years. The City is constantly seeking methods to do jobs that are safer, more cost effective, and at a minimum inconvenience to our residents. When conditions warrant, sewer lines can be rehabilitated by several different methods of internal trenchless rehabilitation, eliminating the need for open excavation. This system takes only hours as opposed to days for conventional methods. One method of trenchless rehabilitation, Cured In Place Pipe (CIPP), has been utilized on a yearly contract basis since 2001. Please reference the Rehabilitated Sewer Map which identifies areas where sewers were renewed/rehabilitated under this maintenance program. Does your homeowner’s or renter’s insurance policy cover sewer back-ups? Despite our best efforts, sewer back-ups may occur. Not all homeowner or renter policies include coverage for sewer back-ups. Coverage can be added for a minimal charge. Check your policy to make sure you are covered. Customers affected by sewer back-ups should call us first. If you experience sanitary sewer problems call us at 614-277-1100. We will see if there is a problem in the main sewer lines that may be causing your problem. By calling us first, you may save yourself a plumbing bill. Most Grove City homes built after 1990 employ curb cans to filter sump pump and downspout rainwater before it is diverted to the City’s storm drainage system. In most cases there are two curb cans per household, one located on each side of the house, near the street curb. If you are unable to determine if your home has curb cans, check the street curb for cored holes. If no holes exist, look for a protective round or square cap in the right-of-way, near the curb. This cap is sometimes covered by grass if not regularly maintained. It is the homeowner’s responsibility to locate each curb can and remove debris. This procedure should be performed twice each year on each curb can to help reduce the risk of basement flooding and/or standing water at the curb. For additional information, download the Curb Can Cleanout brochure. The City of Grove City conducted a comprehensive sewer system evaluation survey (SSES) of the public sanitary sewer collection system in 2012 under a directive of the Ohio EPA. This evaluation is a proactive effort to manage the cost of the sewer system through early detection of defects and strategic planning of improvements. The SSES effort involves evaluating the condition more than 162.5 miles of sanitary sewer pipe. The SSES program uses various equipment and techniques to detect sewer pipe defects, blockages and other problems. These techniques include smoke testing, dye testing, closed circuit TV (CCTV), flow monitoring, rainfall monitoring, manhole inspection, and sewer cleaning. As problems are identified, city engineers determine if sewer lining repair or replacement is needed and schedule accordingly. These efforts are a key component of the City’s Capacity, Management, Operation, and Maintenance (CMOM) Program, the long term strategic plan for managing the sewer system. The goal of the SSES program is to manage the cost of maintaining the sanitary sewer system in order to prevent costly repairs, prevent failures of the system and to minimize the inconvenience to residents. It is imperative that operators of sanitary sewer collection systems implement a long term plan to prevent the occurrence of disruptive problems in the sanitary sewer, regardless of cause. Sewers are grouped into areas known as sewer sheds. A sewer shed is defined by the geographic area collected by local sewers and roughly follow subdivision boundaries. Each year sewer shed areas are selected for inspection, with priority given to areas that have known problems (as documented in the maintenance history or concerns from residents) or by age of construction. The focus has been placed on the older parts of Grove City, centered around the Town Center area. Beginning in the late 1990’s the City has implemented an annual evaluation program and has investigated the condition of the majority of the sewers centered around the older areas of the City. 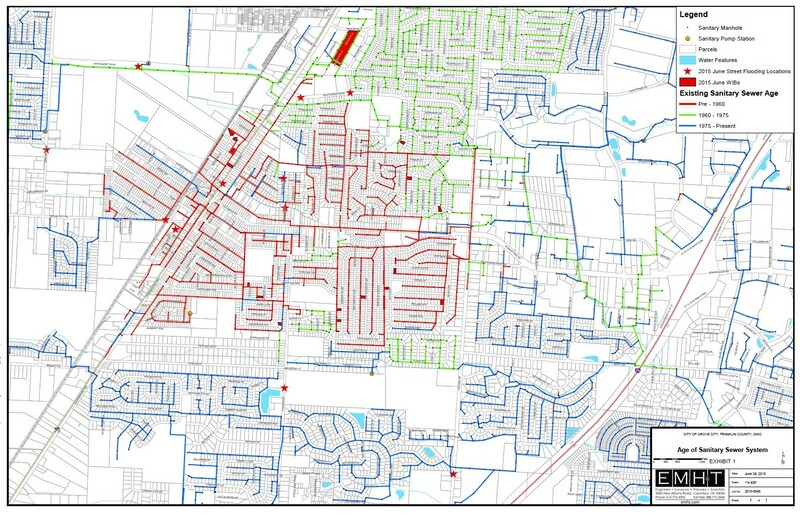 The program is now evaluating sewers in the older subdivisions centered around the downtown area. The City uses a strategic approach that pinpoints areas of concern for detailed investigation. This approach begins with flow monitoring, which measures the flow inside a sewer that collects large area. If the sewer is not performing as predicted, the upstream area will undergo an evaluation using a process known as smoke testing, which blows smoke into the sewer system and problems are found by identifying locations where the smoke escapes the sewers. In areas where smoke is found to escape the sewer, dyed water and a CCTV camera is utilized to find defects in the pipes. Defects are documented and repairs are scheduled according to the severity of the problems observed. Emergency issues, like blocked or broken pipes are corrected immediately. Non-emergency issues, such as cracked pipes or root intrusions, are scheduled for rehabilitation under the annual repair program. Minor issues that can be resolved through maintenance, such as small root intrusions, grease deposits, or sediment, are placed on a routine cleaning or root control schedule. Pipes that are found to be in satisfactory condition remain in the survey schedule and will be reevaluated in the future under the evaluation program. Smoke testing is an efficient means of investigating large sewer areas for sources rainwater and groundwater entering the sanitary sewer system. A smoke machine is placed on a manhole centrally located in the area to be evaluated. Non-toxic smoke is produced and blown into the sewer system. The smoke will be visible at any location where it escapes the sanitary sewer system, like broken pipes, damaged manholes, and cross connections with the storm sewer system. When smoke testing is planned for a particular area, a door hanger is distributed throughout the area up to a week in advance notifying residents and business owners that smoke testing is planned. The door hanger describes the smoke testing procedure, explains how smoke might be observed, advises pouring a quart of water into all drains to ensure there are no dry traps, and advises anyone using oxygen to contact the smoke testing contractor for further coordination. The police and fire departments are also notified of smoke testing activities because residents occasionally call 911 while smoke testing is taking place. Smoke testing is conducted during dry, clear weather with above freezing temperatures so that smoke defects are easy to observe. Smoke testing is planned to maximize the area covered by each setup. The smoke machine is placed on a chosen manhole and smoke defects along upstream and downstream pipes are documented. All defects are photographed, location recorded, noted as public or private, and address of the property is recorded (if applicable). Placement of the smoker is determined at each site by the observed field conditions. Generally the smoker is placed every three to four manholes or approximately 500 feet apart in developed areas. In general, smoke testing areas can be much larger in newer systems than in older systems. When smoke testing reveals a potential connection between storm drainage and the sanitary sewer dyed water testing is considered along with CCTV inspection of the affected pipe. A camera is inserted into the sanitary sewer that is being tested, the storm sewers in the area are temporarily plugged, and fluorescent dyed water is introduced into the storm sewer, ditch, or gutter. Infiltration between the two systems is confirmed if the dyed water appears in the sanitary sewer system. The location of the infiltration or inflow is documented. In some instances, dye testing crews may request access to private residences for the purpose of determining the location of the sewer service line, or to check for leaking service lines. The dye used is non-toxic and water soluble, so although it is bright in color, there is no risk of permanent staining due to the dye. If access is needed to plumbing inside private property, the testing crew will notify the property owner in advance of the testing. Typically notification is given in the form of a door hanger placed on the front door of the property several days to a week in advance of the scheduled testing. Closed circuit television (CCTV) systems are being used to survey the condition of the pipes in the City’s system. This technology uses a television camera mounted on a robotic device that is placed directly into the sewer through a manhole. Once inside the sewer line, the robotic device can be operated by remote control so that an operator can examine the entire length of sewer line between two manholes. The camera’s “pan and tilt” capabilities allow the operator to move the camera in all directions. The CCTV system relays live footage from within the sewer to a high-resolution monitor in the control truck. Since the operator has full control of the robotic system, if a defect is detected, the operator can stop the camera and investigate the defect in more detail. Service connections are also located and documented. An electronic footage counter is connected to the camera, enabling the operator to note the exact location of problem spots. The operator records a video of the internal condition of the pipes which displays important information in a text format on screen as it is generated. The information on the screen includes the date, name of operator, manhole numbers, pipe size, material, distance recorded, defect types, etc. Defects are recorded in compliance with NASSCO’s Pipeline Assessment Certification Program (PACP) and this information is used to rate the condition of the pipes per the standard rating system. The operator creates the condition report as the live footage is viewed, documenting all defects and noting the general condition of the sewer section. The video footage is then stored on DVD for easy archiving and retrieval. The footage is reviewed by a professional engineer to verify the operator’s initial field report according to quality assurance standards. The sewer sections are then given a recommendation for maintenance action according to the observations in the video. Each pipe segment will be given a recommendation for replacement, rehabilitation, root cutting, cleaning, or future inspection depending on the condition. Most segments will receive cleaning, root cutting, or rehabilitative lining. Occasionally lines will be replaced or will receive emergency repairs. Sewers that require rehabilitation are corrected using Cured-In-Place Pipe (CIPP) technology which uses steam pressure to insert a liner into an existing sewer pipe without excavation. CIPP lining is a trenchless process and therefore not destructive to the ground above the pipe. A contractor installs a resin impregnated felt liner through an existing manhole and into the underground pipeline that is being rehabilitated. Hot air and steam is then used to inflate and cure the liner. Once cured in place, the new liner seals up all cracks and points of infiltration and ground water is prevented from entering the section that has been rehabilitated. The CIPP liners contain no joints and are structurally sound. They are capable of supporting the ground and traffic loads on their own, even if the old host pipe deteriorates over time. The rehabilitated pipe then has a new life expectancy of 50 years. The City of Grove City utilizes the same standards demanded by the City of Columbus, all materials go through a stringent testing regimen implemented the City of Columbus Trenchless Technologies Committee. Reference the Rehabilitated Sewer Map which identifies areas where sewers were renewed/rehabilitated under this maintenance program. What is the City’s service responsibility? The City is responsible for the sanitary sewer mains in the public right-of-way (ROW). Most sanitary sewers are located in the middle of the streets or in easements. Others may be in easements along the rear lot lines of the property. The homeowner is responsible for the maintenance of their service line from their building to the sewer main. The property owner is responsible for maintaining adequate sewage flow to and through your private sanitary sewer lateral (also called a sanitary service) to the City’s sewer main. Even though part of your lateral is in the Public ROW, this is still the responsibility of the property owner. When failure or blockage of a sanitary sewer lateral occurs, the City’s personnel will respond to verify that the sewer main is open and sewage is flowing. If the sewer main is found to be clear, it is the responsibility of the property owner to call a licensed plumber or drain cleaning service to correct the problem in the sanitary service. How does the City of Grove City inspect its sanitary sewers? The inspection may be completed visually or via closed circuit TV. Emergency inspections are done as needed. The City’s target frequency is to inspect sanitary sewer lines once every 20 years (5% of the sewer system). The City’s personnel also inspect manholes and other components of the sanitary sewer system. What is the City of Grove City doing to eliminate any infiltration/inflow problems that may exist or develop in the sanitary sewer system? During our televising procedure, personnel note cracks in sewer pipes that might contribute to infiltration/inflow (also known as I & I). The City of Grove City conducted a comprehensive sewer system evaluation survey (SSES) of the public sanitary sewer collection system. This evaluation is a proactive effort to manage the cost of the sewer system through early detection of defects and strategic planning of improvements.